An attic fan is used to regulate air temperatures by ventilating the attic space, keeping the entire home cool and fresh. 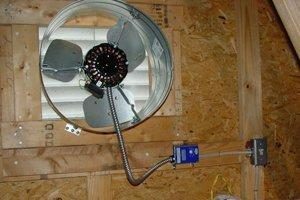 Attic fans conserve energy and save you money when compared to the alternative, air conditioning. How do I know if my attic fan needs repair or replacement? Electrical: Your first troubleshooting step is unplugging the attic fan and changing outlets. If this works the problem may just be a blown fuse or a bad connection. Thermostat: If you’ve ruled out an electrical issue your next troubleshooting step is turning your fan switch on and off. If this step does not fix your problem you may have a faulty thermostat. Motor:If you’ve completed the first two troubleshooting steps without success you may be dealing with a much more extensive electrical issue–your fan’s motor.